I am trying to move my iTunes library from an older external drive to a newer external drive, following this how-to. I got all the way to the part in section 2 where you select iTunes and drag it to the external hard drive. This is where the problem starts. Specs and specifics inside. You can't copy $NAME because it has the same name as another item on the destination volume, and that volume doesn't distinguish between upper- and lowercase letters in filenames. And the only choice I'm given in the pop-up window is an "OK" button--no option to skip tracks and continue or anything. Once I hit "OK," all copying stops. Consolidate the two folders with the same names. Delete what iTunes had copied to the new drive. Start all over again until it runs up against the next duplicate folders. Which will take me approximately eight hundred and fifty billion years to get my iTunes copied over, because my iTunes library is 150GB. Does anyone know of a smarter, faster way to do this? reformat the destination drive with a case sensitive file system. The new drive has other stuff on it. It's not empty. I can't reformat it without losing all my stuff, can I? No, but you can partition it! 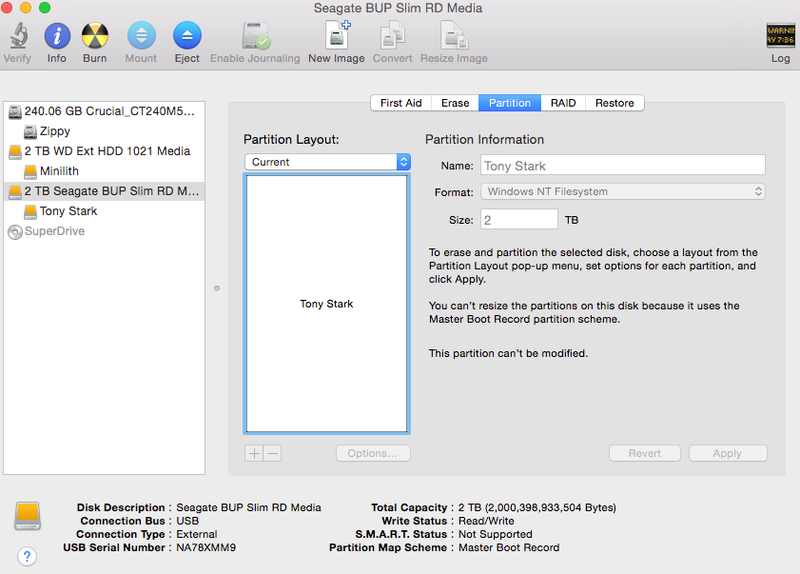 Open Disk Utility, select the drive, click Partition, click +, drag the size, select "Format: Mac OS Extended (Case-sensitive, Journaled)", click Apply. nicwolff - the "+" is grayed out. Here's a snap. Can you move/duplicate the stuff on the new drive temporarily, reformat, then replace the stuff? I can maybe move it to my internal drive, and then try nicwolff's suggestion. I'll post an update when all of this has run its course one way or the other. Thanks for now, everyone. I was able to move all the stuff off the newer drive to my internal drive, then I reformatted the new one with the correct settings, and dragged my iTunes folder over to start copying. I didn't get any error messages! It was going and going! For four hours! At four hours, the transfer window said "about twenty minutes" for remaining time, and that's when one of my cats jumped up on the desk and disconnected the reformatted drive with her rear feet. So.... I'm going to go find an outlet for my rage that isn't my cat, and then I'll try again later. an iTunes library file could not be found in the folder. I have googled every way I can think of to find how to fix this, and nothing is coming up. I hope someone is still reading here and can help me with what to do next. I see the LibraryUni.txt file right there, the first thing in the column, above all the artist folders. What am I missing?